Mt. 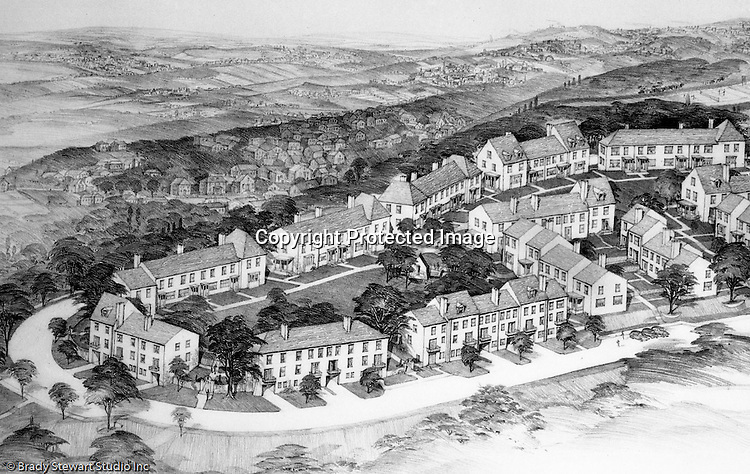 Washington: View of a Chatham Village rendering - 1931. This rendering had a view from the city toward the south hills. Rendering was done by Ingham and Boyd Architects. Chatham Village was funded by the Buhl Foundation and the concept created renown city planners Clarence Stein and Henry Wright. The architect for Chatham Village was Ingham & Boyd, an architectural firm founded in 1911 with offices located in the Empire Building in downtown Pittsburgh. The architecture of Chatham Village was significant as it provided an architectural form to an entire model community with an intent to incorporate the many conveniences of modern living into housing of moderate cost. The architects had to devise new approaches to accommodate the automobile, radio, kitchen appliances, heating systems, and utility infrastructures while also attempting to give full realization to the idealistic goals of the Garden City movement. Copyright: Brady Stewart Studio Inc.
© The Brady Stewart Collection |CONTACT |All rights reserved. Brady Stewart Studio Inc.